Resolver Systems today announces the release of version 1.1 of its groundbreaking program, Resolver One(tm) -- a Rapid Application Development tool for analysing and presenting business data, using a familiar spreadsheet interface. Resolver One integrates databases, code and IT-developed components to create powerful and easy-to-use solutions - all using your existing knowledge of spreadsheets. The power and ingenious flexibility of Resolver One comes from the fact that it is fully programmable with Python code. We've made quite a lot of changes, hopefully making the program more responsive and pleasant to use as well as adding cool new features. Today Resolver Systems announces the release of version 1.1 of Resolver One(tm) , a revolutionary improvement in spreadsheet systems. "We've made quite a lot of changes, hopefully making the program more responsive and pleasant to use as well as adding cool new features." said Giles Thomas, CTO and MD of Resolver Systems. "With this release," said Jean Viry-Babel, Head of Sales, "Resolver One has achieved maturity and we are ready to conquer the data analysis world." 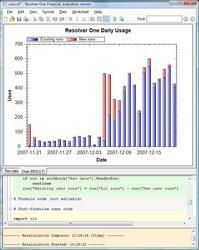 Resolver One uses the Python programming language, which was first released in 1991. Python is an easily learnable and highly expressive language with a rich standard library; it has been successfully used in a wide variety of applications, in businesses and in academia. Its clean syntax allows newcomers to become productive rapidly, while its more sophisticated features and built-in test framework allow experienced developers to build powerful tools which can adapt quickly to changing requirements. Louis Jaouan, Director of Financial Risk at Credit Cooperatif, commented: "In the Financial Risk department, in order to rapidly respond to new needs, we have to write a number of tools ourselves, to access different sources of information and manipulate them, all without having to go to our IT department. We use Excel and VBA, but we prefer Python for its combination of simplicity and power. We were looking to better link spreadsheets with Python programming, and Resolver One seemed to be the most elegant solution because it was based on Python but also gave us compatibility with our IT team's architectural choice of Microsoft .NET. We had been looking at using IronPython for a year but were hesitant to take the first step until we saw the elegant and secure environment provided by Resolver One. I signed up as a beta user as soon as I learned of its existence. Its original conception is intellectually elegant and even though we so far use only a fraction of its capabilities, we have already witnessed a significant increase in the speed at which we deploy new control tools." The Non-Commercial Use License. Free for Open Source projects. The non-Open Source academic or not-for-profit Licence. Resolver Systems was founded in 2005 to produce a next generation spreadsheet. The founders, Giles Thomas, Robert Smithson and Patrick Kemmis, had all struggled with the challenges of running multi-million or multi-billion dollar businesses through poorly debugged spreadsheets. Their solution - Resolver One - seamlessly integrates a powerful and flexible programming language and a traditional spreadsheet environment. Already Resolver One has received extensive interest from companies in the financial, medical and academic communities.